For four years, Jo Kingsbury worked with teams from Glasgow University surveying the diversity of mammals in Bolivia’s Beni savanna region. The expeditions focused on the Barba Azul Nature Reserve, which is supported by World Land Trust (WLT) and managed by Asociación Armonía. During her time in the Beni, Jo was lucky enough to see many of Bolivia’s rare species in their natural habitat. Night is one of my favourite times to explore the Beni. After the scorching heat of the sun, cool evening temperatures tempt out a totally different assemblage of creatures. The best part of any night survey is the possibility of glimpsing a large mammal. Mammals for the most part, tend to be elusive but the Beni has particularly rich mammal fauna and unlike more densely forested regions of the tropics, the chance of happening upon one is vastly improved by the open nature of the habitats there. Nine-banded Armadillos (Dasypus novemcinctus) are common visitors on night surveys. Their presence usually indicated by noisy, half-blind, bumbling as they rustle for grubs and motaçu nuts in the forest leaf litter. Their armoured skin helps protects them from predators but it still surprises me that there are so many – especially when they make so much noise! They never seem to be far from an escape route though; the forest floor is littered with entrance holes to underground burrows, excavated using their long claws. Although their eyesight is poor, there sense of smell is keen and they’ll shoot underground in a flash if they catch scent of a threat. 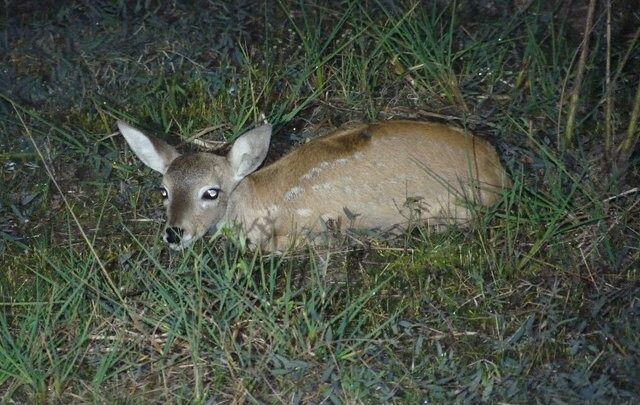 We’ve often come across Pampas Deer fawns (Ozotoceros bezoarticus) in the grasslands. 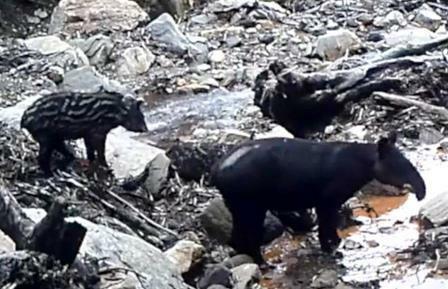 Their mothers frequently leave them in unattended hiding places while they forage. When alone like this, the fawn will freeze if approached, rather than run away. Both these behaviours help reduce the risk of them being spotted and eaten by predators. Sometimes, inquisitive Crab-eating Fox (Cerdocyon thous) will even follow us, hanging around nervously on the periphery of our torch glow – until they lose interest and slink off into the dark. Rarer encounters include brief, unexpected moments with Maned Wolf (Chrysocyon brachyurus). Their lanky, disproportionate legs are actually an adaption to hunting small mammals like mice in the tall savanna grasslands. Their call is distinctive – a strange barking “Baa-wooo” often described as a “roar-bark”. The sound can travel for miles. I’d often hear it just when I was settling down in my tent. A lovely good night from the wild! 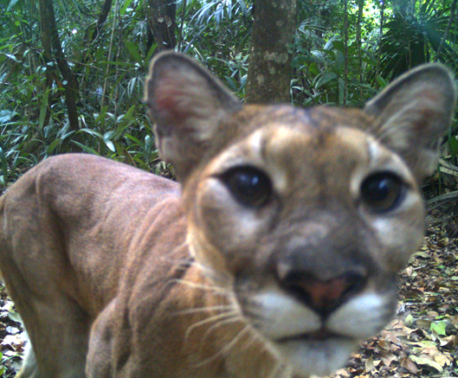 My luckiest encounter so far though (and also my scariest), was coming into contact with a Puma (Puma concolor), while out with a survey team in the forest. We’d seen nothing all night – and now we know why. We were returning home when a fearsome growl erupted from the bushes. Time to back off slowly! When we checked the forest camera traps in the morning we found pictures of a big adult male that must have followed us for a while. The presence of top predators is a great sign, indicating that the ecosystem is healthy enough to support them. It means the hard work that Armonía is doing and the support that WLT is providing to help protect the Barba Azul Reserve is really making a difference. On night surveys we use a technique called “lamping” to detect mammals – it involves scanning for eye-shine using powerful torches. However, mammal habits differ greatly between species, for example, Black Howler Monkeys (Alouatta caraya) are diurnal (active in the day) and rarely detected at night. Others, on the other hand, are considerably more elusive. Big cats, for example, and very rarely spotted by chance. For these reasons, we use a variety of survey methods to increase our chances of recording all of the species present on the reserve. One such method is camera trapping – using small digital cameras that take pictures or clips of film when they are triggered by the motion of a passing animal. We mount the cameras on trees along bush trails or near watering holes that we know are frequented by animals. Some of our most interesting data has come from these – snippets of insight into the behaviour of the Beni’s mammals. As the Ocelot is a species I’ve not yet encountered, this video holds a lot of magic and reminds me there are still many mysteries waiting to be discover in the Beni. Jo Kingsbury is currently working for RSPB Scotland as a project officer on a local landscape conservation programme. Support conservation in Bolivia’s Beni savanna by donating to Buy an Acre and specifying Bolivia in the comments box.